Introducing our “Hall of Fame Legends” series where you will hear live jazz, it’s roots and influence. The Big Band era in American history and its impact on our culture is undeniable. We are thrilled to provide an opportunity where we can once again celebrate Big Band music live. Our artists rarely have a chance to do this anymore and they love it as much as the crowd. Among the hundreds of popular bands during the Big Band era there was quite a range of styles. From Count Basie, Bob Crosby, Benny Goodman, Duke Ellington, Glenn Miller, Woody Herman, Chick Webb and many many more that you can hear again for the first time live at Sun Valley. Over the years our Big Band Jazz sets have become some of the most popular. Because of this, we now feature Big Band music on three nights. One evening we have an all star collection, led by Joe Midiri with handpicked artists from our featured bands. On Saturday night we always have a packed house for the Kings of Swing doing their tribute to Glenn Miller and his orchestra. The dancers come out in droves for this! 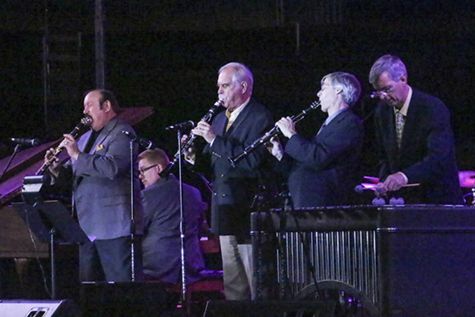 As I have heard many remark after attending just one of these “this one Big Band set was worth the entire price of admission” and we wholeheartedly agree. Whether or not Big Band jazz music is your cup of tea you won’t want to miss any of the incredible performances. “It don’t mean a thang, if it ain’t got that twang…” More than a dozen banjo players got together at the Sun Valley Opera House to fly, claw, and pluck themselves through some very fun songs. Led by Gary Ryan, who can do just about anything on the 5-stringed instrument with deep roots in Jazz. The Sun Valley Jazz & Music Fest’s “Grand Finale” puts 13 of the fest’s best acts on stage in a mere 90 minutes, one after the other. The packed Continental Room at the Sun Valley Inn thoroughly enjoyed the show, and the artists delivered impassioned performances. What a great festival, and a fabulous final show! 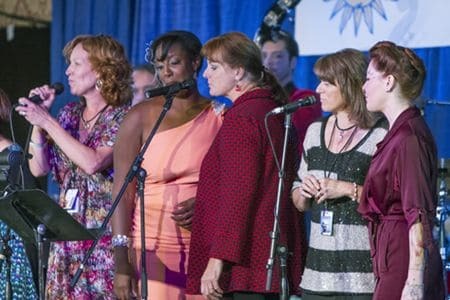 Visit sunvalleyjazz.com for information about the artists and 2017’s event! Two piano players. Married. Playing the same piano. At the same time. And they’re truly incredible! Sun Valley music fans have a lot to be thankful for with the presence of Trick & Alderighi at the SV Jazz Fest. Visit stephanietrick.com to learn more. Bravo!